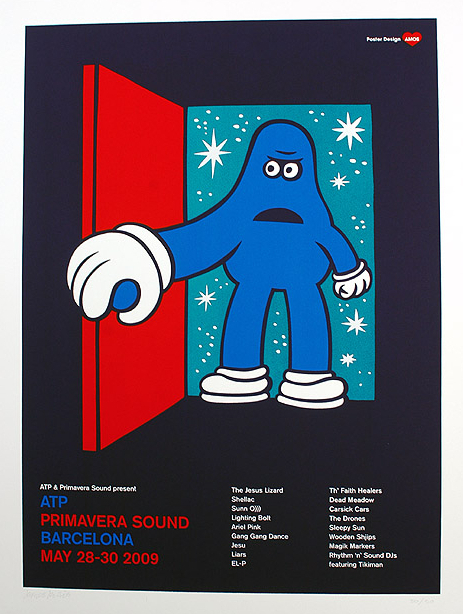 Official ATP poster from Primavera Sound 2009, Barcelona Spain. Limited Edition of 250 hand-numbered prints. Designed by James Jarvis (AMOS). This festival featured the artists: THE JESUS LIZARD, SHELLAC, SUNN O))), LIGHTING BOLT, ARIEL PINK, GANG GANG DANCE, JESU, LIARS, EL-P, TH' FAITH HEALERS, DEAD MEADOWS, CARSICK CARS, THE DRONES, SLEEPY SUN, WOODEN SHJIPS, MAGIK MARKERS, RHYTHM 'N' SOUND DJs FEATURING TIKIMAN.